The next few days could well be considered days of bad luck. Friday 13, which is today, is traditionally one that many people consider unlucky. Then Sunday 15 July is St Swithun's Day. 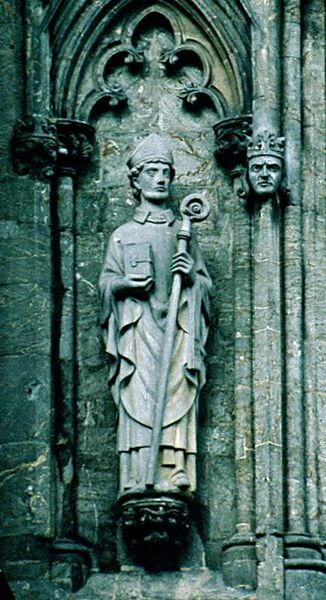 Swithun was Bishop of Winchester from 30 October 852 to his death on 2 July 862, and his feast day is celebrated in England on 15 July. However, this is best-known nowadays for a weather lore proverb, which says that if it rains on Saint Swithun's day it will rain for 40 days. If Sunday is as wet as most of the recent days have been, then it looks like there'll be no let-up in the rain for the rest of the summer. However, most of us these days are not scared of bad luck on Friday 13, according to research done recently by a bingo operator. Apparently only 8 per cent of people in the UK nowadays think Friday 13 is unlucky. The fear of Friday the 13th has been called friggatriskaidekaphobia, Frigga being the name of the Norse Goddess for whom "Friday" is named and triskaidekaphobia meaning fear of the number thirteen. Avoid pavement cracks: “Don't step on the cracks or you'll break your mother's back”. It is not known exactly where this came from although it is likely to have derived from a childhood rhyme. Knock on wood: There is a long tradition in western folklore of literally touching/knocking on wood, or merely stating that you are, in order to avoid tempting fate after making a favourable observation, a boast, or speaking of one's own death. Keep fingers crossed: Thought to originate from the fingers making a sign of the cross when crossed. Not walking under ladders: Before the gallows were invented, murderers were hung from the top of a ladder, and when they died, it is said that their ghosts remained for a long time where they had fallen. This made ladders very unpopular places. Wear something shaped like a clover: A fourth leaf represents good luck – the other three representing faith, hope and love. Have a horseshoe in the house: Many believe that to hang a horseshoe with the ends pointing upwards is good luck as it acts as a storage container of sorts for any good luck that happens to be floating by, whereas to hang it with the ends pointing down, is bad luck as all the good luck will fall out. Put your right foot out of bed first: In ancient times, it was considered unlucky to set the left foot on the ground first. This was because the devil was said to be left-handed. Carry an acorn: During the Norman Conquest, the English carried dried acorns to protect themselves from the brutalities of the day. Considered to be an emblem of luck, prosperity, youthfulness and power. Carry a rabbit’s foot: Originates from China and South America where for centuries it has been believed that carrying a severed rabbit’s foot wards off bad luck. Just discovered your blog and oh wow I learned alot! I love to learn new things while being made to smile at the same time, thank you very much! I just discovered your blog as well and enjoyed reading through your posts. Will bookmark it. Carol - It sounds like that Friday 13 was a lucky day then.